This vibrant flowerpiece is more uncommon in Maze’s work than his vivid light-filled landscapes, townscapes and figure studies. 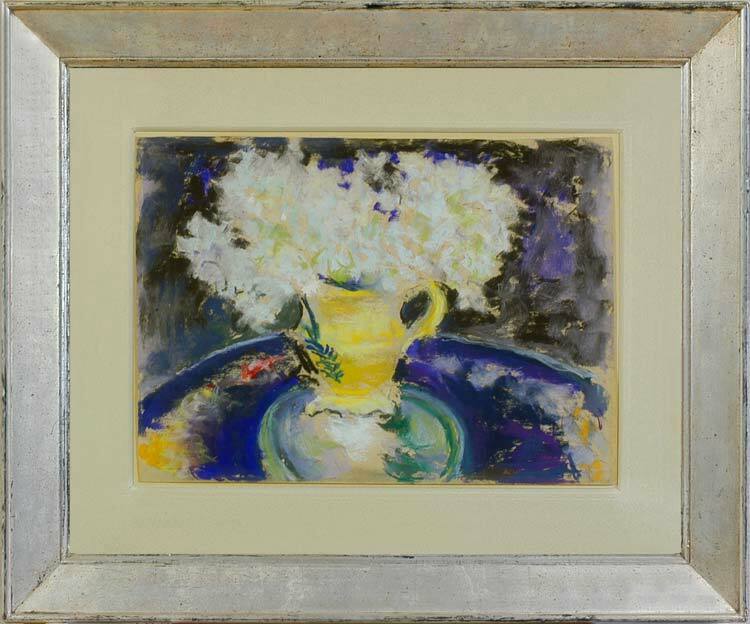 It is interestingly reminiscent of interiors and still life paintings by his friend Vuillard – the artist who introduced him to pastels and encouraged him to concentrate on this medium. It may have been painted in Maze’s cottage in Midhurst, Sussex, which he shared with his second wife, Jessie, and which seems to have been filled with flowers, melding seamlessly into the sunlight and growth of the garden he depicted so often. The shower of white blossom – azaleas? rhododendrons? – in a yellow Victorian jug is rapidly sketched in (a British soldier once told Maze that ‘your pictures are done in shorthand’), the characteristic beige paper clearly visible. This, with the dark background and lacquer table, emphasize the luminosity and frailty of these ephemeral flowers like a memento mori. Paul Maze was born in Le Havre in 1887, and by the time of his death was known both as ‘the last impressionist’ and ‘the lost impressionist’. He was also seen as recompense for Britiain’s having lost the English Sisley to France. His father was a tea merchant and an art collector, the friend of Pissarro, Monet, Renoir and Braque; so Paul’s early years were spent watching the Impressionists at work and learning from them. He went to school in England when he was twelve, and his fluency in two languages meant that, during the First World War, he was able to serve in both the French and British armies. In the Second World War he served in the British army again, finally retiring with the Military Medal and bar, the Distinguished Conduct Medal, the Légion d’honneur and the Croix de Guerre. He wrote A Frenchman in khaki of his experiences during WWI, but also drew continually whilst away. He worked in pastel, catching his peers in action and at rest; he met Churchill whilst in the trenches, taught him to paint and remained friends with him throughout his career. Churchill wrote the foreword for the 1939 catalogue of Maze’s first exhibition in New York, in which he noted that Maze is ‘a vivid and powerful interpreter to us of the forces and harmony of Nature’. After the First World War Maze worked in France alongside Derain, Bonnard and Vuillard. He used various media, including oils and watercolour, but is perhaps best known for his pastel paintings: he was encouraged to concentrate on pastels by Vuillard, who in 1932 introduced him to his own colourman. La Maison du Pastel had sold pastels in France since the 18th century; in 1878 it was bought by a chemist and artist, Henri Roche, who experimented with pastel production, seeking for luminous, adhesive colours in a wide range, and supplying Degas and Whistler. His son, another Henri Roche, increased the number of colours to around 1600, which was ideal for Maze’s subtle vision of still life and landscape; he described being taken to meet Dr Roche by Vuillard as being ‘taken by God to meet God’. By 1920 Maze had married an Englishwoman, become a British citizen, and moved to Chelsea. In 1925 he had his first solo exhibition in London, and by 1953 had been appointed official painter of HM the Queen’s coronation. He portrayed all aspects of English topography – the streets of London, the British countryside, scenes of social occasions such as Cowes and Goodwood ; and, after he married his second wife in 1950, produced a series of masterly portraits of her (the Jessie pictures). In 1983 there were important retrospective exhibitions of his work in both London and New York. Works in public collections include The Harbour, Ostende (Southampton City Art Gallery); The funeral of George VI, 1952, and The State Coach outside Buckingham Palace, 1953 (Government Art Collection); A scene in Venice (Harrogate Museums & Arts); Villefranche, 1924 (Manchester Art Gallery); Whitehall in Winter, 1920, Yachts, 1928, and The Rowley Mile, Newmarket, 1929 (Tate).